Isaac Atencio (William J. Palmer ’16) has been named a captain of the 2019 Cleveland State Vikings. The junior defenseman played in every game last season, starting 11 contests. He led CSU defensemen with 22 ground balls nd added 10 caused turnovers. He had perhaps his best game against nationally ranked Denver when he tallied six ground balls and three caused turnovers. The Cleveland State press release is presented below. CLEVELAND, Ohio – Head coach Dylan Sheridan of the Cleveland State University lacrosse team announced Tuesday the four individuals that will serve as captains for the 2019 season. Juniors Isaac Atencio, Quinn Lemke, Danny Tesler and Nick Wendel were chosen as captains. Atencio played in every game last season, starting 11 contests on the defensive end. He led CSU defensemen with 22 ground balls in 2018 and added 10 caused turnovers. Meanwhile, Atencio himself only committed two turnovers the entire year. Atencio tallied six ground balls and three caused turnovers at nationally ranked Denver. Lemke missed the entirety of last season due to injury but still was with the team throughout the campaign, assisting in various capacities. He started each of the first 12 games of his freshman season on defense. Lemke notched nine ground balls and five caused turnovers in 2017. Tesler was the team’s primary choice at the faceoff X for the second straight season in 2018. He won 135 faceoffs and collected 70 ground balls and ranked among the top 25 in Division I in ground balls per game for the second straight year. He won 10-of-16 faceoffs against Duke and 16-of-27 against Robert Morris, both nationally ranked opponents. Tesler also added four goals and three assists on the season. Wendel played in every game in 2018, starting 12 of 14 contests. He scored 12 goals on the season, posting multi-goal outings at Air Force and against Sacred Heart. He also added tallies against top-tier foes Duke, Ohio State and Penn State this past season. Wendel now owns 27 goals and six assists in his Viking career to date. 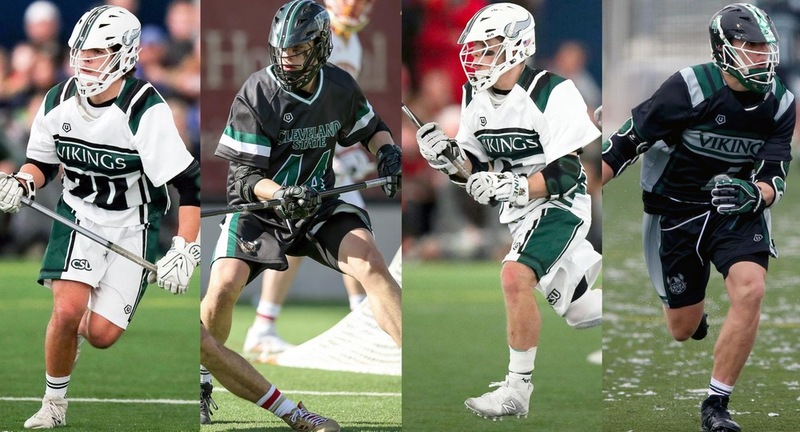 Cleveland State’s 2019 schedule will see it face seven preseason top-25 teams along with hosting a pair of Big Ten teams. The Vikings will get the campaign underway with a home scrimmage against The Hill Academy Saturday, Jan. 26.